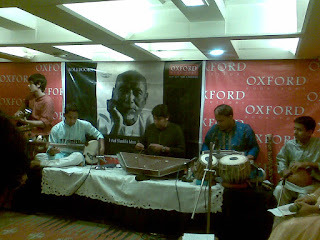 The Oxford Bookstore was filled up with the strains of sarod, santoor, guitar and the tabla. An orchestra of young musicians led by Shiraz Ali Khan, great-grandson of Ustad Alauddin Khan, was paying his tribute to the legendary musician. I was lucky to be there , to see the four generations of the greatest musical family in the history of Indian classical music. The occasion was the launch of Boro Baba … Ustad Alauddin Khan, a memoir of the legend written by Alladdin Khan’s eldest great-granddaughter Sahana Gupta (daughter of Late Dhyanesh Khan, son of Ali Akbar Khan and sister of Shiraz Ali Khan ) and published by Roli Books. Sahana herself is an IT professional working in Bangalore. Alauddin Khan’s grandson Aashish Khan, son of Ali Akbar Khan released the book, which tells the story of a man who sought oneness with God through his music. Sahana sifts through Baba’s handwritten manuscript, photographs and letters to construct his life through the time when he survived on alms to learn music, to his becoming the master. In between her reading music was played by his brother. Allauddin Khan (also known as Baba Allauddin Khan) (1862 – 1972), was a Bengali sarod player and multi-instrumentalist (tabla,violin,sitar, Sarod etc.) , composer and one of the most renowned music teachers and probably the greatest icon of the 20th Century in Indian classical music . In 1935, he toured Europe, along with Uday Shankar's ballet troupe, and later also worked at his insititute, 'Uday Shankar India Culture Centre' at Almora for a while. During his lifetime, he composed several ragas and laid the foundation of a modern Maihar gharana. He was the father of sarod maestro Ali Akbar Khan and Annapurna Devi and guru to Ravi Shankar (interestingly Baba never played sitar publicly), Nikhil Banerjee, Vasant Rai, Pannalal Ghosh,Bahadur Khan. He was awarded the Padma Vibhushan, India's second highest civilian honour in 1971, and prior to that in 1954, the Sangeet Natak Akademi awarded him with its highest honour, the Sangeet Natak Akademi Fellowship for lifetime contribution to Indian music. Allauddin Khan was born in Shibpur village in Brahmanbaria (now in Bangladesh). Allauddin's elder brother, Fakir Aftabuddin, first taught him some music in the home. At the age of ten, Allauddin ran away from home to join a jatra band, a traditional Bengali form of theater. This experience exposed him to the rich folk tradition of Bengal. 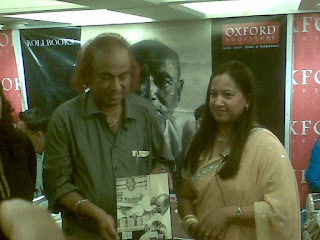 After some time, he went to Kolkata, and was accepted as a student by singer Gopal Krishna Bhattacharya, alias Nulo Gopal. According to Sahana all his money was stolen when he woke up in the morning just beside one of the ghats of Ganges(rather Hoogly river) in Kolkata. Allauddin committed to a 12-year practice program; However, Nulo Gopal died of plague after the seventh year. Khan then became a disciple of Amritalal Dutt, a close relative of Swami Vivekananda and music director at Kolkata's Star Theatre, with the goal of becoming an instrumentalist. At this time, he also took lessons in European classical violin from Lobo, a bandmaster from Goa. He got interested in sarod after a concert at Jagat Kishore Acharya's, zamindar of Muktagachha, where he listened to Ahmed Ali Khan, a student of Asghar Ali Khan (Amjad Ali Khan's grand-uncle). Alauddin became his student, and studied the sarod under him for five years. His next step was to go to Rampur for lessons from Wazir Khan Beenkar, court musician of the Nawab there, and one of the last direct descendants of the legendary Tansen. Through him, Alauddin was given access to the Senia gharana (Tansen school of music), arguably north India's most coveted body of musical knowledge. He later became the court musician of Brijnath Singh Maharaja of Maihar Estate in Central Province. At Maihar he was given an accommodation and a monthly salary by Brijnath Singh Maharaja of Maihar. Allauddin was a very religious man, and though Muslim by name, was strongly devoted to the goddess Saraswati, in the form of Sarada Devi, to whom there stands an old and famous temple atop a hill in Maihar. This is why Allauddin, despite more lucrative offers from other courts, never left Maihar, refusing to move away even for hospital treatment – he would rather die near Sarada Devi than live someplace else.